1. For all your Shingo Shimizu updates and to connect on Facebook, join the Shingo Shimizu Facebook page! 2. Just added new Twitter & Facebook 'Like' buttons on the bottoms of each post as well. So keep pressing those buttons please! 3. The NEW music page is setup as a seperate journal from my blog. It's just easier this way. Also thinking of a final stab at a straight up analog vinyl mix before I give into Serato fully. So look out for that! I'm also working on a few animated buttons. We'll see how that goes. Of course I'll have a tonne of updates with new stuff going on. Until then, have a great weekend! 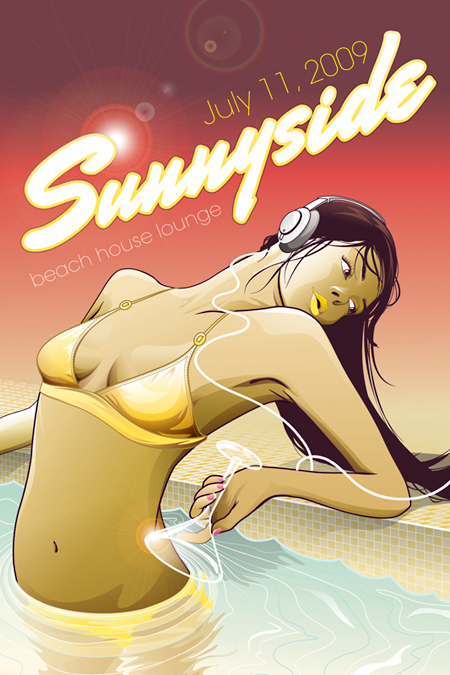 If you're in Toronto in the summer, you know Sunnyside Pavillion is an amazing venue to get your groove on while soaking up the sun. The good boys at Milk. and Brooks Events are throwing it down, with Richard Brooks (Chorduroy Music) as the special guest for the first party. This first piece is part of a series, executed in a similar vain as the HedKandi covers.